Jill Armayor started her professional writing career in 1996, publishing Web articles on weight loss for the Cooper Aerobics Center. She has continued writing Web content, marketing copy and articles for other companies along the way, including Tessera Performance. Armayor holds her Master of Science in exercise and sports nutrition from Texas Woman's University. If you live in the United States, chicken is probably a staple in your diet, especially if you have implemented a healthy eating plan. Part of the meat and beans group of the Food Guide Pyramid, chicken is full of essential nutrients that your body needs, while carrying fewer of the unhealthy qualities that other meats have. A boneless, skinless chicken breast is an excellent low-fat food that can be prepared in a variety of ways and that fits into many different cuisines. A 3-oz. boneless, skinless chicken breast packs 27 g of protein, containing all the amino acids essential for human health. Protein is a major building block of all muscular tissue in your body, including skeletal muscle, heart tissue and smooth muscle found in the walls of your intestines. Proteins are also responsible for the maintenance and building of other structures in the body, such as cells and bone, and the performance of many crucial jobs, including the breakdown of toxins. 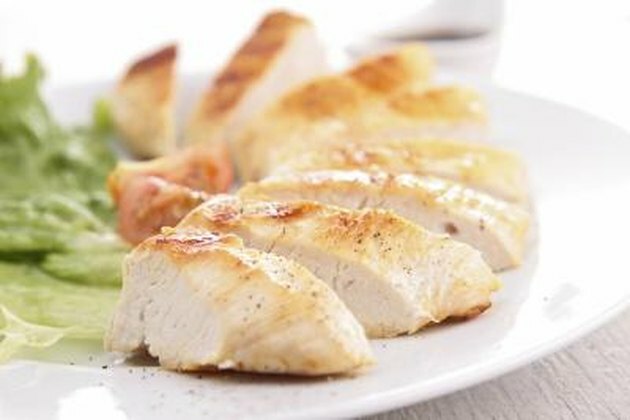 A chicken breast is relatively low in saturated fat compared to many protein alternatives, especially when the skin is removed. By substituting chicken for higher-fat cuts of meat, you will lower your risk of developing heart disease by reducing your LDL, or "bad" cholesterol. Eating lower-fat alternatives will also help you maintain a healthy weight. Grilling, broiling and baking are great cooking methods to keep the fat content at its lowest. Chicken is a great source of selenium, a trace element that has been shown to fight cancer. Selenium is also thought to have a positive effect on the incidence of other degenerative diseases, including inflammatory diseases, cardiovascular disease, neurological diseases and infections. Selenium is an antioxidant and has positive affect on the activity of vitamins C and E in their ability to fight cancer-promoting free radicals. Chicken contains 24 micrograms of selenium per 3-ounce portion, or 44 percent of the selenium you need daily. Vitamin B6, or pyridoxine, is found in chicken and helps in the metabolic process of protein and carbohydrates. It assists in the production of insulin, white and red blood cells, neurotransmitters, enzymes, DNA, RNA and prostaglandins. Without vitamin B6, your immune system, metabolism and central nervous system would not function properly. The active form of Vitamin B6, called pyridoxal phosphate (PLP), has the largest effect on human metabolism. Each serving of chicken contains 40 percent of your daily recommended vitamin B-6 intake. Vitamin B3, also known as niacin, is found in plentiful amounts in poultry and meat. Vitamin B3 is responsible for converting carbohydrates to energy and maintaining the health of the body's cells. Vitamin B3 has also been shown to have cholesterol-lowering effects, and therefore it is thought to have a positive effect on the reduction of the risk for heart disease in those who have high cholesterol levels. Chicken provides 84 percent of the daily niacin intake for women and 74 percent for men.